Moghul Express is a small takeout place on Oak Tree Road whose sole claim to fame is that it is a sibling of the deservedly famous Moghul Restaurant. 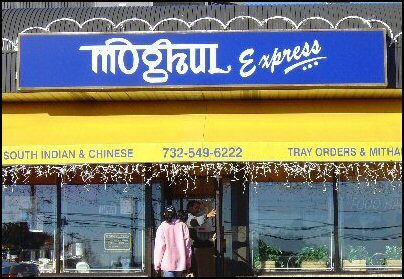 Since the Moghul brand is quite powerful in the Oak Tree Road area, Moghul Express does brisk business as well, particularly on weekends. Beside sweets and standard South Indian fare such as Idli, Dosa, Medu Vada, Tamarind Rice and Lemon Rice, Moghul Express' menu features a variety of Chinese dishes including soups, appetizers, vegetarian and non-vegetarian entrees, noodles and fried rice. Chinese items on the menu include Chicken & Egg Noodles, Vegetable Chopsuey, Chicken Schzewan and Shrimp Fried Rice. When we visited Moghul Express the other day, there was also a Chaat stand in a corner. We ordered a few pounds of mixed sweets ($11 a pound), Chicken Manchurian ($7.50), Chilli Garlic Rice Vegetarian ($6.25) and a Mysore Masala Dosa ($6.00). There are just a couple of tables for customers. As for other dine-in customers, they are forced to stand at small tables and eat in a cramped space. As we waited for our food to be ready, we opened one of the sweets packets. We had ordered mixed sweets to get a flavor of the different items while our friend placed a separate order for some Jalebis. To our disappointment and given the Moghul reputation, the sweets were very ordinary while the Jalebi was less than average. Jassi Sweets at the other end of Oak Tree Road offers assorted sweets that cost far less ($6 a pound) and taste much better. Down the road, Sukhadia also offers tastier sweets. Our food order took about 12 minutes to get ready since the place was crowded. The Dosa took an additional five minutes. After all, it was a Saturday and the place was teeming with Desis. Our Chilli Garlic Rice lacked the strong flavor of either chillies or garlic that we'd grown accustomed to. It was a big letdown. A perennial favorite of ours, the Chicken Manchurian came with lots of thick gravy and enough white rice. It was easily the best item we tasted at Moghul Express and we dug into it with much gusto. As for the Mysore Masala Dosa, there was nothing special about it or the bland Chutney that came with it - the usual Mysore Masala Dosas that you can get at scores of Indians restaurants on the East Coast. All in all, we found Moghul Express to be a cramped take-out place that serves mediocre food. We found the Chinese food at the nearby Chopstick to be far superior in taste. But unlike Moghul EXpress, Chopstick does not offer South Indian food or Chaat. Food items at Moghul Express - both vegetarian and non-vegetarian - are priced similar to what Chopstick charges. Pricing for the sweets at Moghul Express are unjustifiably high. At $11 a pound for ordinary sweets, it's daylight robbery. But such is the power of the Moghul brand that people wait about five minutes just to order and another 10-15 minutes for the food to be ready.